WHEN a business owner dies or becomes permanently disabled, the business itself may die or be permanently disabled on the same day – not because something wrong was done – but because nothing was done! According to a Forbes article, when Samsung Electronics chairman Lee Kun-Hee suffered a heart attack in May, investors began to consider the impact that a sudden, accelerated leadership succession might have on the company. Lee is expected to eventually hand the reins to his son, Lee Jae-yong, 45, who has worked at the company in various capacities for 23 years. Does the younger Lee have what it takes to steer Samsung forward in today’s competitive business environment? The founders of most family businesses are now looking at their own children and wrestling with this same question. For them, the next five years is critical. This is the peak succession period as 30 percent of family-owned firms will experience a change in leadership due to retirement or semi-retirement. In my work as a family business coach in the region, one of the most important factors that affect family business transactions is the lack of a clear, well-defined business succession plan. The lack of such a plan may create a conflict between the potentially inconsistent goals of family unity and the continued financial success of the business. Another very important factor is the failure to address the issue of who will run the business – the issue of “control.” In an intergenerational (2nd Generation) or multigenerational (3rd Generation) family of several siblings and cousins, this poses quite a challenge of choosing a successor and can cause sleepless nights for the patriarch and senior generation members. Additionally one other neglected factor is the failure to ensure that the surviving spouse has a market for the business ownership that they have inherited and sufficient income that will reasonably last for their projected lifetime. 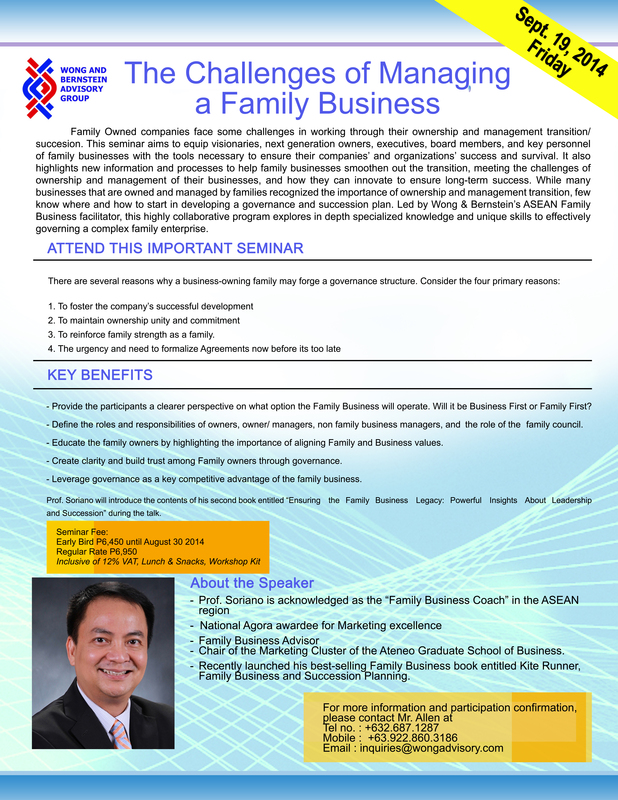 Without a well-defined business succession plan, the family business will collapse! The reason why we are talking about these issues is that proper business continuation planning canensure the future succession of the business, andavoid conflicts between the remaining owners and the family of the deceased owner. When we use the term “business succession plan” it actually has several components. First of all there is the human component. The second major component is the agreement itself. This component is often the most difficult and challenging part of the succession planning process and the reason why many owners never get their planning finished. 1) Who are my key players? 2) Have I promised ownership to anyone other than my existing partners? 3) Are there family members already working in the business and how do I judge their commitment to the business for the long haul? 4) Is there an “heir apparent” for control of the business? Did I promise that person they would have control? 5) Are there family members or in-laws who are not currently involved in the business but will want to be a part of it in the future? This could be family members who are children or students who plan to enter the business in the future. There are many other important questions that affect the long-term survivability of the business. Due to space constraints, I will tackle those questions in another column. For now, the message to the founding and senior generation leaders is loud and clear. Do not neglect or set aside the issue of business succession as the “Do Nothing” option has dire and irreversible consequences.It is not only the least logical, the most costly, the most destructive, and yet sadly and by far and away the most popular! 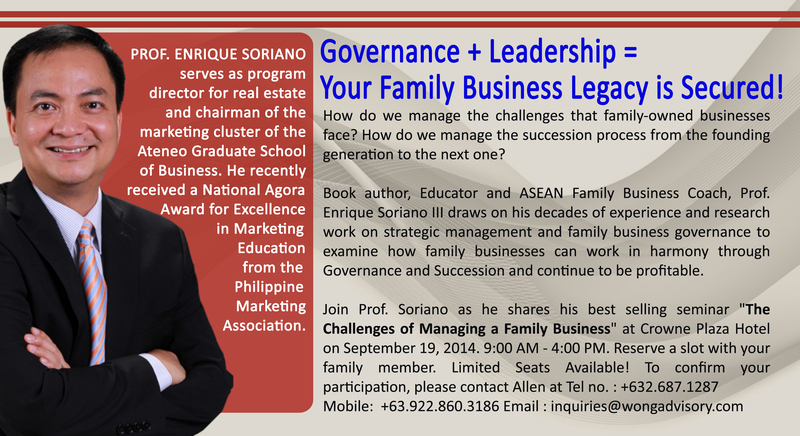 This entry was posted in Articles and tagged business, business bloodline, business dilemma, business first, business policy, Challenges, Family Business, family enterprise, Family first, generations, Philippines, seminar, Strategic Planning, strategies, the family business on August 19, 2014 by erikmsoriano. This entry was posted in Events on August 18, 2014 by erikmsoriano. POLICY development cannot be put off forever. Family members must formalize and set down on paper the structure and guidelines under which the family will own and operate their business. Having agreed policies in place and abiding by them reduce the chances that family conflicts will destroy your family business. If you procrastinate, brace yourself for the downfall. Without agreements on how family members work together in the family business and with different views of what the family business should be about and what should take place, conflict is almost inevitable. Businesses need rules by which to operate – and if they don’t have them, they fail. What are rules? Rules are authoritative statements of what to do or not to do in a specific situation, issued by an appropriate person or body. It clarifies, demarcates, or interprets a law or policy. Likewise, rules are statements that establish a principle or standard and serves as the norm for mandating action or conduct. What are rules for, anyway? Rules replace thought and discretion. If you know the rules, you always know what to do. Rules are comfortable. If you know the rules, you never have to stretch too far. Rules are safe. You probably won’t get fired for following the rules. So how can siblings make some fair rules that will help them live with – if not solve – their differences as they run the family business? In a given setting, they may be relating to one another as siblings, as business shareholders or as operational managers. Again, each relationship must have rules. And here lies the dilemma, “the business context encourages productivity and profitability, whereas the family context encourages nurturing and acceptance.” To stress this point, is it a Family First Business or a Business First Business? To overcome this confusion, the family must agree and choose which one is best for the business. With the choice of either Family First or Business First, the rules set forth for the family business will inevitably move towards the family’s philosophy, mission, size, industry, and resources available. Those guidelines must be consistent with the family’s values. The next step is to recognize that “the relationship” is not just one relationship – it’s three. The family: Siblings need to decide, and preferably put in writing, what kind of family they are. What is the nature of the bond? What does the family stand for and what kind of legacy does it want to leave, if any? In short, what are your family values? The shareholders: The owners of the business – who are not necessarily the managers – must decide what their goal is, and determine the requirements of future inheritors. Who can own shares? Should the business leave a legacy for the owners’ children or should it be sold before the next generation grows up? The family business managers: These are the rules for running the business. Can one sibling report to another? What is the compensation for each job? What information will be shared, and in what time frame? With the relationship divided into its parts, protagonists can decide whether a particular conflict is a family, shareholder or managerial issue, and go to the rule book. Note that this also means that if you can’t abide by one set of rules, you can bow out without affecting your status in the other categories. If you can’t work for your brother and the rules say you must, find another job. You are still a shareholder and a member of the family. h) Increase the likelihood of long term business and family success, survival and prosperity. This entry was posted in Articles and tagged business bloodline, business dilemma, business first, business policy, family, Family Business, family enterprise, Family first, relationship, the family business on August 6, 2014 by erikmsoriano.